The Spurs coach and Harvard professor engaged with San Antonio youth about their potential to make change during this uncertain time. This country is currently rife with crisis and conflict. If you are young, have black or brown skin and are without financial means, the less likely your concerns will be heard. 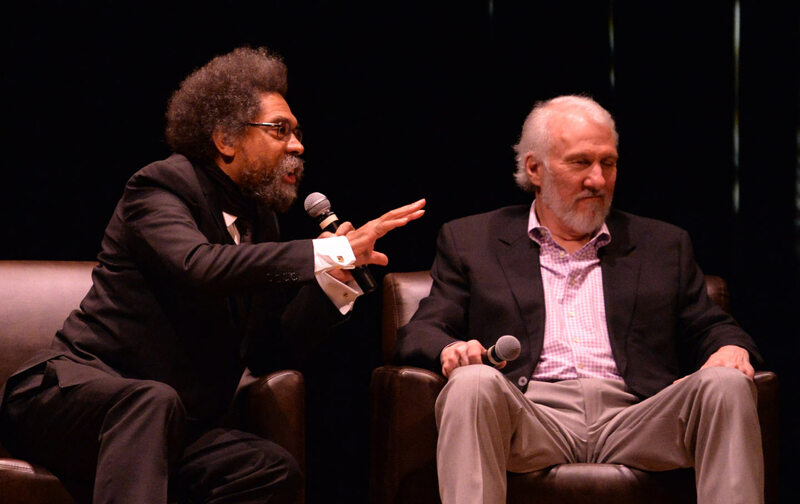 On a Sunday in San Antonio, Spurs head coach Gregg Popovich and Harvard professor and civil-rights activist Dr. Cornel West tried to chip away at that suffocating status quo. The basketball coach and the author/educator are both renowned in their fields, and yet they’re not necessarily two people we put in the same sentence. But on November 20, Coach Pop and Dr. West sat on a stage at the Carver Community Center and for over two hours they took questions from 250 students who attend Sam Houston High School on San Antonio’s East Side. Also in the audience were the Spurs, the coaching staff, everyone who works on both the basketball and business operation for the team, as well as invitees from the broader community. Somehow, I was the moderator of this event, and it was as unforgettable as it sounds. For over two hours, the students asked tough questions about the state of the world and their own place within a country that just elected a president who, in their view, seems to hold them in open contempt. Pop and Dr. West answered in kind, without condescension and with straight talk about the importance of education, the state of the world and how these young people could navigate our troubled times. Both Pop and Dr. West also spoke with emotion about how important it was for students to know that this wasn’t just a fly-by event but that they would be there to help the Sam Houston community going forward. There were lighter moments as well. At one point Pop and Cornel West engaged in the duet of “Soul Man” by Sam and Dave that probably won’t garner them a record deal. But most importantly what I saw in San Antonio was the shape of things to come: hundreds of engaged young people seeking ideas for not letting this current political moment define the limits of their future. After this event took place, a basketball commentator for ESPN asked me how the organizers of this event “got Coach Pop to do it.” The answer is that no one got Coach Pop to do it. This was his idea. He made it happen in the middle of the season, and the Spurs organization backed him to the hilt. That’s the part of this story that matters. We can all be change-makers, no matter where we work and no matter who we are. We can all take the time to listen to young people and impart the message that the way things are isn’t necessarily the way things have to be.